Read the report and see our gains! 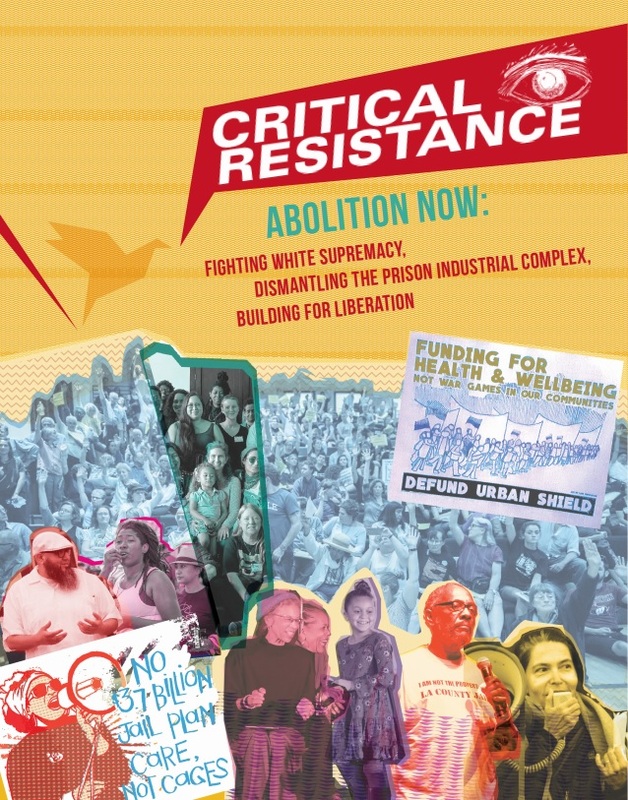 Critical Resistance is energized by the growing demand to move beyond the violence of imprisonment and policing and towards a society that centers health and self-determination. It’s a ripe moment for advancing abolition, and we are ready to keep the movement growing. On the eve of 20th anniversary of CR’s founding 1998 conference, “Critical Resistance: Beyond the Prison Industrial Complex,” it is empowering to see years of concerted organizing and your loyal support coming to fruition. In 2017, CR ran transformative campaigns and projects, through the work of small staff, four chapters, a dedicated membership and hundreds of volunteers. In workshops, presentations, rallies, hearings, publications, and countless conversations, we advanced analysis and bolstered campaigns that are making headlines and impacting policies and practices. No New Jails: With three campaigns fighting jail expansion in major U.S. cities—Los Angeles, New York City, and San Francisco— we are uplifting these campaigns and increasing resistance to jailing nationally. Eliminate the Violence of Policing: Our Oakland and Portland chapters are running campaigns and projects to curb the violence of policing and halt the encroachment of policing into the programs and services that communities need for health, resilience, and emergency response. Empower and Organize with Prisoners: Through our bilingual newspaper, chapter prisoner mail programs, collaborative prisoner reports, and Inside-Outside Reading Groups, we are bridging the silencing divide of prison walls and bringing people into outside organizing movements. Building Vibrant Internationalist Movements: In 2017, CR continued to strengthen our existing partnerships, build new relationships in chapter cities, across sectors, and supported abolitionist causes in key areas such as Miami, Atlanta, Chicago, and even Australia. In addition to joining demonstrations and running campaigns, we released media and educational tools to support analysis and abolitionist foundations, including the Breaking Down the Prison Industrial Complex video project and our Abolition of Policing workshop. It’s been twenty years since organizers kicked off the efforts to build a popular, more unified movement against the prison industrial complex with the founding 1998 conference. Since then, the analysis, ideas, and, increasingly, the strategies of Critical Resistance have been in high demand. Even more is possible for our movement and our organization. We’re hopeful and ready to keep building and growing. Our work is not possible without the generosity of supporters like you. 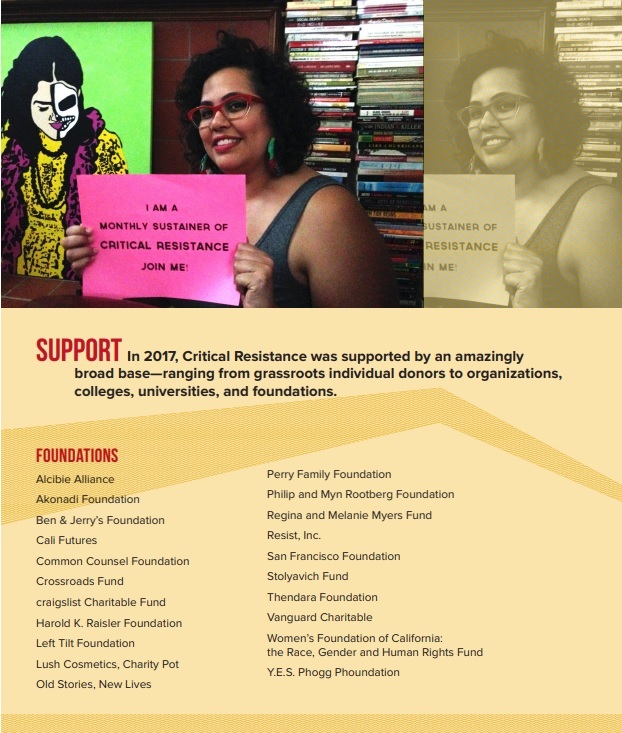 Donating to Critical Resistance is a great way to help build the movement to abolish the prison industrial complex! Make a gift for abolition today.